It is of course unquestionable that every single food is improved with the addition of cream. I used to think that there should be no limits to the amount of cream that could be added to food. Four years living in the South West of France disabused me of this notion. Careful and judicious use of creases in car design can often improve the look of a car. The indiscriminate and widespread addition of creases and weird protuberances to cars however does not necessarily guarantee improvement. I’m not sure if Lexus have quite understood this. This “premium” marque has been with us for almost 30 years. They have done a pretty good job of building a brand and creating an aura of reliable prestige around some pretty reliable but bland fare. These upmarket Toyotas always seemed to appeal to people of a certain age who are probably pretty wealthy but don’t want to be too flashy. Despite a massive development budget and engineering nous second to none they seemed to skimp a little on cost when it came to design. 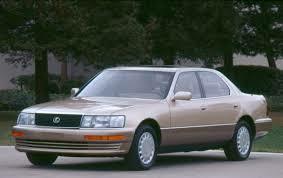 The very first Lexus (the LS400 launched in 1989) certainly wasn’t a bad looking car. In fact I always quite liked it’s honest, bluff hybrid W126/W140ish looks. It was like the people they wanted to sell it to. It really worked and it spawned smaller saloons, various SUVs (I use the term advisedly) and even a couple of sports cars. The word “sport” is quite accurate in relation to the LFA and maybe some of their F models. The word “dire” might be more accurate in relation to the SC and convertible IS. Sometime around the early to mid noughties it seems that they were finally stung by the general consensus that Lexus made well engineered reliable cars that were at best uninteresting to look at. I mean just looking at at 1999 GS would quickly sap your will to live. It truly was a drab flabby looking car. The following year the SC430 was inflicted on us. Surely we didn’t deserve this. During the noughties though the looks definitely became sharper, more creased and in my book better. The 2006 IS and GS (and to a lesser degree the ES) were marked improvements on what went before. 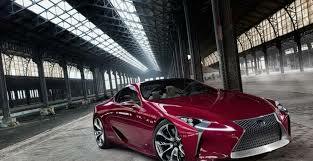 It seems that these sharp suited cars spurred Lexus to significantly up the creasage quotient. They felt that the A3 was having it’s own way far too easily in the premium hatchback market. It seemed a no brainer that a hybrid hatchback with a few fancy touches and a Lexus badge would sell like proverbial “hot cakes”. Takeshi Tanabe is the name of the designer who was charged with sculpting their assault on this previously untapped market. 2011 saw the launch of the dogs dinner that carried the CT moniker. Truly pedestrian performance didn’t help but it was the addition of bulgy overhangs and oddly shaped windows while keeping the sharply creased grille that made this car an incoherent shambles. Worse was to come. About three months ago I was walking up to my house from my local store and I saw an NX parked near the laneway. I mentally commiserated with the owner of this brand new crossover. There seemed to be a large dent in the front bumper as if they had driven into a low wall. However as I was actually passing the car I realised this was how the car was meant to look. There was a weird bulge just below the B pillar just above a unfortunate looking dinge and the tail lights were so horrible it looked like the car was physically pushing them away. Further excrescences below the headlights and just ahead of the fog lamps completed this mish mash of folds and carbuncles. Is this some sort of anti pedestrian device? Both the new IS and GS are similarly (although not quite so seriously) afflicted and yet somehow the RX has managed to remain (through various iterations and facelifts including the recently launched model) the most non descript SUV ever sold. For a fleeting moment I felt that there might have been light at the end of the tunnel. A brand new coupe, the LC looks very sharp yet avoids the NX’s “just been rolled over at least three times” look. Then the poor relations across the corridor released the new Prius. Now I was never a fan of this car during any of it’s previous life cycles but just look at the overstyled shambolic mish mash below. This is not a concept car. Unbelievably it looks even worse in the metal! Now I know that design philosophies change and in 10 years even Lexus (and now Toyota) will look back and wonder what the hell they were smoking at the beginning of the ’10s. However right here, right now someone needs to tell them that you can have too much of a good thing. “Less cream” PLEASE! Baffling. 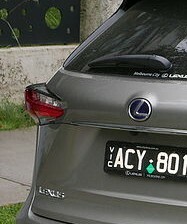 Lexus have a very good product. 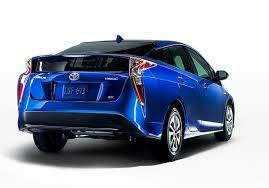 Its customers believe in the cars’ solidity. That goes right back to the LS400 which is still as credible a vehicle as the Mercedes and BMWs it fought with. I just love that car’s steely character. Baffling because since then they’ve tried everything from simplicity to wild to wierd and with a lot of bland in there too. If they had added 2% more “a little something” and 100% more design consistency they would be the Lancias of this time (I’m referring here to then 60s Flaminias not the Lybras and Prismas that came later). I have to agree with you on all but the SC430. Yes, I like it for what it is, a boulevard cruiser. I agree the SC was a boulevard cruiser with a lovely V8 and it did exactly what it said on the tin. I just really didn’t like the look and especially not it’s proportions . A lot of people thought that. I’m in the minority on this. Two words, clean lines. Why add bumps and depressions, unless it is to improve the aerodynamics. Totally agree. I think they wanted so much to make sure it couldn’t be said they were bland and boring that they went totally over the top. The NX really is unbelievably bad! One possible explanation for today’s overstyled cars is that the good ideas which are related to orderly solutions and a tendency to simplicity are in short supply. The principles of design haven’t changed. Technology has reached a point where manufacturing is at a high state of capability but not changing. Two drivers of change, then are only weakly pushing designers compared to the pressing need for a new car to get noticed and for a new designer to get noticed. I’ve seen things done on cars that are not too disimilar to ideas I sketched 20 years ago and rejected for being rubbish. That was my bad luck for being cautious. Simplicity wins every time for me. I’m certainly not an expert on clothes but a little black dress is the classiest thing any woman can wear. Everyone remembers Chanel yet she created some of the simplest and cleanest clothes ever. Same with cars. Henrik Fisker? What will his legacy be? Give me Sacco any day of the week. It’s a real pity there is so much pressure to be different for differences sake.